I don't know how I first came upon this website, but I do remember seeing Iain Sharp's Mac-ITX project and thinking - this is truly amazing! 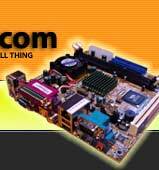 I'm a fan of all things retro, but my computers have all been put together from stock parts, and no matter how much you try to source the components, they never really fit the home decor, and they are just not unique. At the same time my notebook was slowly dying from XP bloat, it's internet connection was dodgy, and the Transmeta Crusoe processor was running so slowly I could have a shower and breakfast before synchronization had completed between the computer and my phone. I really needed a replacement. 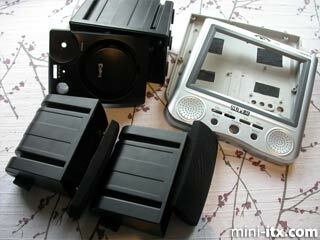 Fortunately, I managed to purchase a relatively cheap EPIA M board on eBay and set about looking for a case for it. In the end I found a great 1970s National "portable" television set (once again thanks to eBay) which I thought would make the perfect case for my first ever computer case mod. Unfortunately, this being the first, I was not particularly fastidious in documenting the process, so please forgive me if the photography is patchy! The first thing I did was take apart the case. My main concern was that I did not want to have to modify the case at all, that meant keeping all the openings and hoping I could reuse them for the different ports. I also didn't want to have loads of wires popping out the back, hoping to keep the computer as true to its TV roots as possible with only a single power connector in the back. The television was filthy! It had probably sat in someone's attic for years. There was a 8 and 3/4 inch CRT inside, a number of simple PCBs and, as this was a portable television, a huge rechargeable battery. Interspersed amongst this were dust bunnies the size of small elephants and a couple of scary-looking capacitors with some rust coloured fluid leaking from them. Unfortunately, it was impossible to recycle any of these, although I would have liked to reuse the CRT, so all the contents went into the bin. I then gave the case a good scrub down in the bathtub. The next step was to try to find a replacement for the tube. Although it would have been great for accuracy to fit a CRT back into the space, it proved virtually impossible to find a CRT that size which would also take a VGA input. 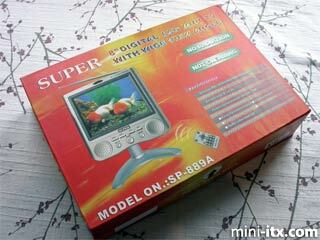 In the end I went for a brand new portable 8 inch LCD TV. It's resolution was is a rather low VGA (640x480), but it had its own tuner (which would be handy), an infrared remote control and a VGA cable to connect to a video out. I also looked for a suitable set of speakers. The old TV had rather poor, unshielded speakers, but since was was going to use the ITX TV for multimedia as well I decided to get a small 2.1 system. I found a cheap set from a local electronics store which was on sale. I wasn't expecting great sound but it was bound to be an improvement,and I was hoping that the space within the TV case would help with the bass. The "subwoofer" had the added advantage of a rotating volume control knob which I thought I could hook up to the huge tuner dial on the front of the TV. So now it was time to put it all together! I took apart the cases of the pair of tweeters and the subwoofer which freed up the cones themselves as well as the power supply - you can see the remnants above. The LCD TV then came apart as well - this consisted of the LCD screen and 3 PCBs, one for the aerial, one for the controls and one for the input and output connectors. I mounted all these components into the front half of the case, with the speakers in the base behind the front grille, and the the mini-ITX board behind the LCD. I still wanted to be able to control the motherboard and the LCD image from the outside, so I bought a couple of cheap black push-to-make switches and soldered them to the control board of the LCD TV (the orange and white wires). The motherboard switches I retrieved from some old computers my work was about to throw out and changed the actual switches on these to really pressable big red buttons! From the same old computer I retrieved the HDD and power LEDS - I changed the actual LEDS to ones suitable for the case mod. The HDD LED went to the old charging indicator to the lower right of the screen, and the power LED went into the space which was previously occupied by the headphone jack. The next step was to add the power supply. In order to keep the number of power cords coming out the back of the TV to a minimum, I mounted a multi adapter on the inside of the back of the case. 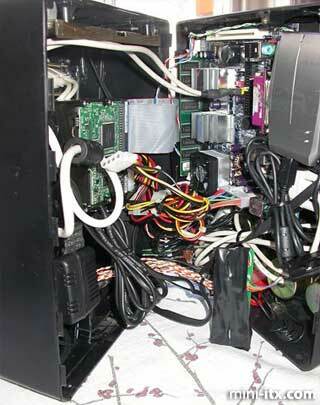 This allowed me to plug in the power supplies to the motherboard, the LCD screen and the speaker system. I am sure there is a simpler way of stepping the voltages down for each of these components, but it worked well. I used a conventional ATX PSU and a 3.5 inch 80GB HDD which had been discarded by a friend when he upgraded his system, and mounted both in the top of the rear half. 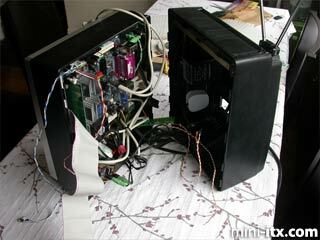 The rear half is also home to a case fan, absolutely essential since it is pretty cramped in there and gets pretty hot! 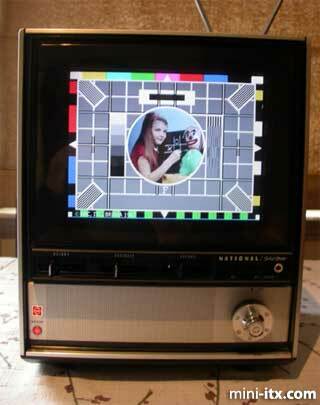 When I first put it all together the reception on the TV was appalling. The original TV did not come with an aerial, but with a port to connect your own external one. I don't have an aerial in my bedroom and so decided to buy one. eBay to came to the rescue again, and I managed to get a retro-looking telescoping one which suited the case perfectly and was easily mounted. 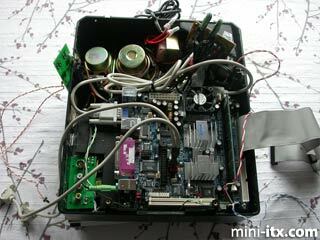 The final touch on the back was to attach the two USB ports and all the switches to control the LCD and the motherboard.